The luxurious hotel offers 202 duplex suites, ranging from 170 sq. mts to 780 sq mts, across 27 floors each with its own Guest Services exclusive for in-suite check in and butler services. Suites include the Deluxe Suite, Panoramic Suite, Club Suite, 2 Bedroom Suite, 3 Bedroom Suite, Presidential Suite and Royal Suite. The Burj Al Arab is located in the Jumeirah Beach area of Dubai, 15km from the main city area and 25km from Dubai International Airport, central to Dubai’s malls, nightlife and attractions. The luxurious hotel is aldso accessible by helicopter transfer or chauffeur driven Rolls Royce or BMW limousine transfer at a charge. Emirates airlines fly regularly to Dubai from most major cities. The Burj Al Arab is one of the most luxurious 5 Star Deluxe hotels in the world, located on its own man made island in the Jumeirah Beach area of Dubai. The billowing sail inspired structure of the luxurious hotel soars to a height of 321 metres, hosting 202 duplex suites with floor to ceiling glass windows across 27 floors each with sprawling views of Dubai and the Arabian Gulf. The ultra luxurious hotel boasts its own submarine ride to the underwater Al Mahara restaurant, complete with a shark-infested aquarium and guests are ferried to the mainland on golf buggies which cross the private 280 metre bridge. Other features include the world’s fastest lifts, more than 9,000 square metres of gold leaf, marble, granite and crystal which feature in the interior décor of the luxurious hotel, fire-spouting volcanoes, leopard-skin furniture and the world's largest atrium. 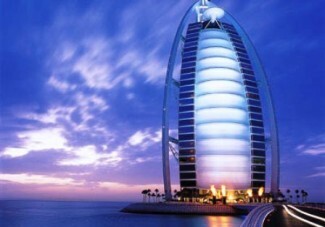 The Burj’s vast royal suite - the hotel's most expensive - which is on two floors, has its own lift and revolving bed. All suites have laptop computers, faxes and 42-inch (106 cm) television screens. At night the hotel lights up with choreographed colour sculptures of water and fire. The hotel has an army of 40 butlers and guests can choose to transfer from the airport either by helicopter or in one of a fleet of eight Rolls Royce limousines. Each suite has a dining, living and office area complete with laptop, Internet access, private fax, printer and copier; a hidden network of advanced technology which operate lighting, curtains and air-conditioning at the touch of a button; 42 inch plasma screen, video on demand, DVD and 93 cable channels; a walk-in shower and Spa Pool/Spa bath; and a private bar. The hotel’s leisure facilities include the Assawan Spa & Health Club on the 18th floor, unlimited access to Wild Wadi Water Park, a Rolls-Royce chauffer shopping experience, a scenic helicopter tour over Dubai, a private beach, a yacht charter and access to world class golf courses. The luxurious hotel offers eight restaurants and lounges and private banqueting and meeting facilities.